Winter in Vermont offers an outdoor play land. Ski, snowshoe, go tubing, snowmobiling or fat biking. There’s something for everybody. There is one thing on which everyone can agree. Once you come inside, nothing is better than something warming to eat. That’s why we are offering two delicious recipes from Vermont inns for hearty, warming soup. This first recipe comes from the Landgrove Inn, Note the inclusion of a little real maple syrup, a particularly Vermont ingredient. Notes: If using leeks, cut most of the dark green leaves off. You want the part that is light green. Peel outer layer off. Slice down the middle and then each half into thin slices. Soak in cold water, agitating it to release any dirt particles. Allow leeks to sit. Any sand will drop to the bottom of the bowl. Celery root is mild in flavor with slight celery after taste. You can use vegetable stock or just water. The chicken stock is used to add additional flavor. 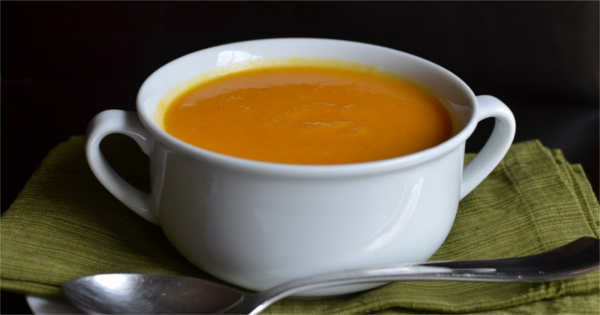 Puree soup in a standard blender or use an emersion blender right in the pot. Be very careful of hot liquids as they can burn you. Never fill a blender more than half way. Always cover lid with a towel and never lean over machine while it is running. Directions: In a large saucepan, melt butter over low heat; cook leeks or onion until translucent. Add in celery root, chicken stock, and heavy cream. Simmer covered or uncovered until celery root is fork tender or starts to fall apart. Add in maple syrup. Puree all ingredients. Add more liquid to reach your desired thickness. Keep in mind that the cooking liquid will evaporate some and you may need more to thin the soup. Season with salt and pepper. Enjoy! Here’s another soup recipe courtesy of the Echo Lake Inn in Ludlow. (The restaurant has been featured in both Gourmet and Bon Appetit magazines.) You’ll notice, this soup contains the magic of maple syrup also. Saute onions in butter until transparent and soft. Cover pan and bring to the boil. Simmer until the squash is tender. Puree in a processor and add maple syrup and season to taste. Add more stock (or cream) to adjust the consistency of your bisque if needed. So, what goes better with Vermont skiing or other winter sports? Why, Vermont soup, of course. Need some suggestions of where to stay and what activities are available? Consult Vermont.com’s Winter Ski Resorts for ideas.